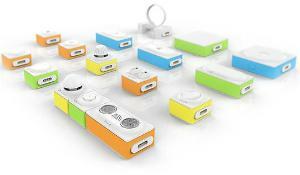 Makeblock Neuron is an electronic building block platform for STEM education. It contains more than 30 kinds of blocks with different functions, so creators can build a variety of innovative gadgets. Through intuitive flow-based programming, creators can take full advantage of blocks to turn unlimited ideas into reality. Neuron gadgets can be software independent. You can play Neuron gadgets with/without software namely in online/offline mode. In offline mode, you can build a gadget to activate a servo operation using Ultrasonic Sensor. In online mode, combined with our Neuron App, a gadget can be programmed to have complicated action sequences for servo operation and control its movement remotely. There are infinite ways to Plug and Play!